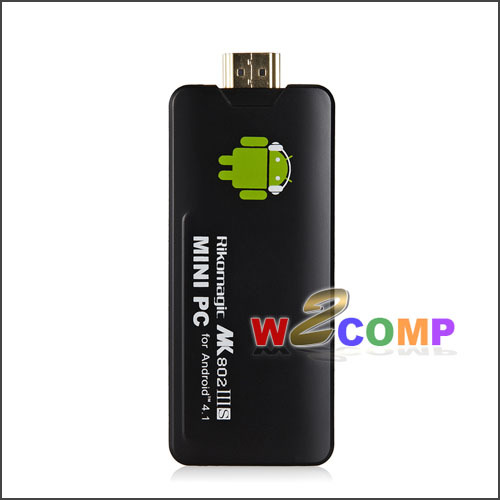 The whole thing is very simple – a black box with HDMI connector, standard USB port, micro-USB port to connect the power source and a slot for micro-SD card (which is called “TF card” meaning “Trans Flash” card). Turning on the device is very simple – just connect it to a power source and it starts booting. The HDMI is used for connecting screen – I’ve tried with a Panasonic plasma TV (through HDMI) and an old Hyundai LCD using an HDMI/DVI reduction and both worked without issues. In case of the TV it worked with audio (guessing by the sounds when using GUI in the OS). Regarding power source – the USB cable has USB connectors on both ends, so if you need to connect it to a regular socket you’ll need a convertor – something like this. Luckily, these are used for mobile phones, so I already own several of them and chances are you too. Or you may use a micro-USB adapter, obviously. I’ve tried an older adapter with a 3.5mm jack and a micro-USB reduction, but that didn’t work and the device kept rebooting endlessly. Probably due to low current or something like that. Clearly, the device has no keyboard or a mouse, so you need to connect something – if you want to connect the box to a TV in your living room you probably don’t want cords so you’ll use a wireless keyboard/mouse set. I’ve used RF 2200, probably the cheapest wireless set from Hama, and it works perfectly so far. The box has a single USB port, which is just enough for a wireless set, but if you’re going to use anything else you’ll need a USB hub – I’m using star with 4 USB ports, and I haven’t noticed any issues so far. Unfortunately, right after the first boot the chinese origin and rushed release (doesn’t matter it’s not well tested, we need to release it before Xmas) started to demonstrate itself. The default firmware (released mid-October) frequently notifies “android.process.acore” process failure, some apps tend to crash/freeze and it’s not possible to restart them – the only solution seems to be a hard reset. Luckily it takes just about 30 seconds, which is bearable. What’s quite annoying is there’s no “restart” or “power off” choice so you have to unplug the power source. I’m wondering what’ll happen to the data not yet written to the device? Luckily, there’s a firmware update available which makes the issues much less frequent. But even applying the update is a struggle – per the instructions, it should be enough to download the archive, extract, copy the update.zip to the micro-SD card and insert it into the micro-SD slot. The device will mount the card and identify there’s an update available and offer you installation. Until this point it worked as expected, but all my attempts failed on verification of the update. The SD card is fine (I’ve even used it on an Android phone) and all the files were OK too. and then the upgrade worked just fine. But even with the new firmware some of the don’t work, but the overall impression is much better. The primary reason why I bought the device was to make a simple Skype setup on my TV in the living room, so that I could do video calls there – using TV for audio and video, and a USB cam. The original firmware was terrible in this regard – the Skype kept crashing immediately after signing-in (it’s one of the crashing apps I’ve mentioned above) but with the new firmware it started to work a bit better. The text messages work just fine, audio calls seem to work although sometimes they end with a message that there’s an issue with old Skype client (although it seems to happen when there’s no microphone connected to the MK802). Video calls don’t work at all – the Android obviously does not recognize the USB webcam so it cannot send video, but for some reason it does not even display video send by the other party. I’m not sure who should buy this device – if you’re looking for something working “out of the box” then MK802 III is not a good choice for you, at least for now. It’s hal-cooked, it crashes frequently and will make you angry. Sadly, I’m not aware of a good alternative – it depends on what you want / need. If you need something to play, it might be a good choice, although I think other devices (e.g. the already mentioned Raspberry Pi) will give you a better support and opennes, and the communities are a bit larger. There’s a quite nice forum about Rikomagic products at rikomagic.co.uk, and it seems they’re working making Linux work on MK802 III, but it will clearly take some time. And though it’s obviously not something you can carry around to read e-books off, like a tablet or phone, it has surprising potential as an e-reading device, most of all for the educational market. And with the tablet market engaged in a race to the bottom on price, it’s worth underlining how dirt cheap these PCs-on-a-stick are. 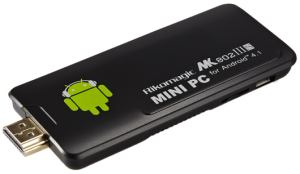 The UK retail price for the Rikomagic MK802 III is £59.99 (US$97.00) for the 4GB model, or £64.99 (US$105.00) for the 8GB. For that, you get a 1.6 Ghz dual core chip, a microSD slot for storage expansion, a full-size HDMI jack to plug straight into a TV or monitor, a full-size USB host socket, and a microUSB socket for power. And Android 4.1, better than most Android phones, with Google Play access. Other manufacturers of similar devices offer even more compelling feature sets, or even keener prices. > No, you can’t read books straight off it. And you do need at least a screen before you can doanything with it. > Since it doesn’t have a battery, you also need a USB or mains socket to power it, and it turns off as soon as the plug is pulled (so remember to save). 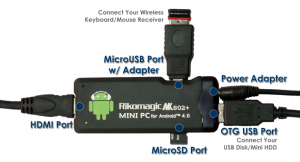 > The cheapest model doesn’t have Bluetooth, though there is a handy Rikomagic app on the Google Play store that puts a virtual Wi-Fi mouse and keyboard on your phone or tablet. > And the device definitely needs some tinkering to get the best out of it, making it better for hobbyists than average consumers. It’s not for Android newbies, and 4.1 on here doesn’t feel like the butter-smooth experience it is elsewhere. > Also, the top-end Tegra Android games won’t run on it, alas, given its obvious potential as a gaming platform. But the mere fact that we’re contemplating high-end games for such a machine shows its capabilities. It comes close to being the dream device that you can stuff in your back pocket, and work or play on anywhere with. And for teachers, if you want to give a presentation to a class or read through a book together, you can just plug it into the classroom monitor or projector, then open up the Kindle app (or any common e-reader software), and off you go. I can imagine a teaching scenario where pupils can then either sync their own tablets, or use similar stick devices at home. The display quality with a good monitor and this machine is almost good enough to make me consider reading books on a TV. Productivity is a cinch: The device is a rock-solid keyboard host with a USB hub, and can run any number of productivity apps, including Google Docs. The Rikomagic MK802 III basically makes the ideal budget device for classroom guided reading. That’s quite a contribution for hard-pressed school budgets. So if you feel it could suit your or your school’s needs, why not give it or its ilk a go? You’d be risking almost nothing, and potentially gaining something really useful and really fun. Skype Yes, but this device does not built-in microphone / camera.